When I went home for a few days, I was greeted by the greatest weather I could hope for. Well, at this time of year anyway. And in Charleston, no less. I left New York right before the sickly heat wave struck, and I managed to land in relatively mild weather. This break in the weather, coupled with a fully-functioning air-conditioning unit made it possible for me to bake up a storm. I made ice cream. I made cake. I made bread pudding. I made quick-bread. Don't worry; I promise to share it all with you. 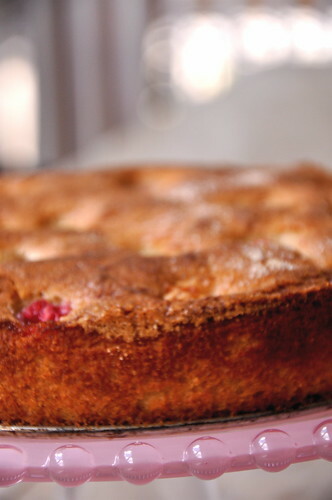 But, out of everything I made, this cake was undoubtedly and absolutely my favorite. 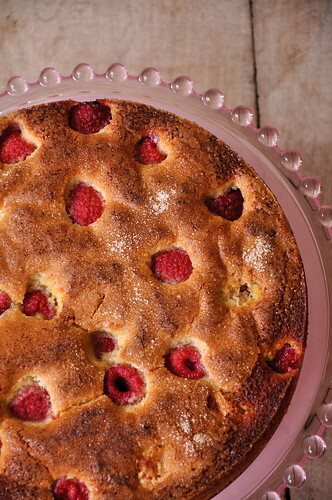 This lovely, tender cake hails from Provence. Originally made with raisins, it is a wonderful blank canvas for any fresh or dried fruit that strikes your fancy. 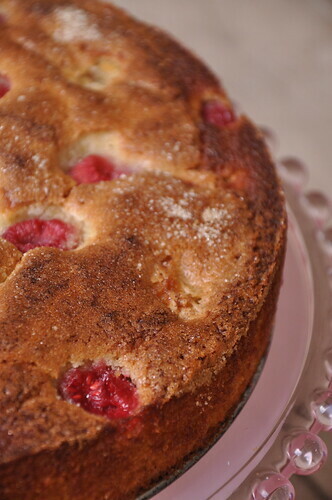 It is subtle, yet still seductive, flavored with sweet wine and sprinkled with sugar. It is as delicious as it is beautiful- delicate, almost floral, and dangerously addictive. Preheat oven to 400. Brush a 10-inch springform pan with olive oil. Whisk together the flour, baking powder, salt, and baking soda together in a medium-sized bowl. Beat together 1 cup sugar, 4 tablespoons butter, and ¼ cup olive oil in a mixer fitted with the whisk attachment. Beat in eggs and lemon zest. Add dry ingredients in three additions, alternating with wine. Transfer batter to prepared pan. 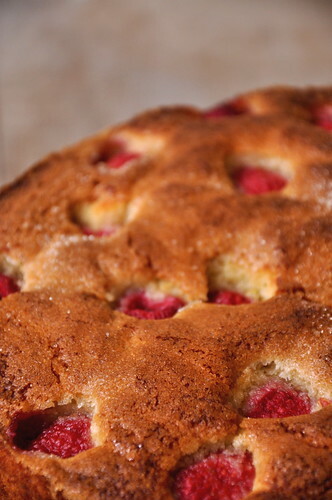 Sprinkle raspberries over batter. Bake for 20 minutes, until the top is set. 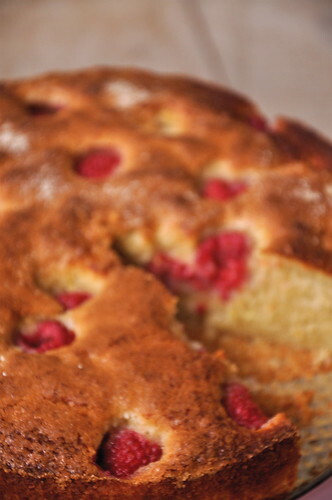 Dot the top of the cake with remaining tablespoon butter, sprinkling with remaining 2 tablespoons sugar. Bake 15-20 minutes more, until golden and a toothpick inserted in the center comes out clean. Let cool completely and release from pan. olive oil, wine, and berries -- yum!